Hey everyone! 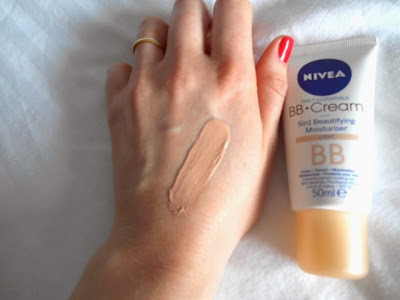 Okay, so today I'm reviewing Nivea's answer to the growing trend of facial BB (Blemish Balm) creams. I personally am not the most adventurous when it comes to changing up my make-up routine. I know what I like and I tend to stick with it until something better comes along. My long-time favourite foundation is Estee Lauder's Doublewear which is just amazing stuff, but recently I've found myself wanting something a little lighter and a little less full on. Every so often I like to take a few days off from wearing full coverage foundation and just let my skin breathe. I always see good results when I 'dare to go bare' and this week I've actually really enjoyed the break. 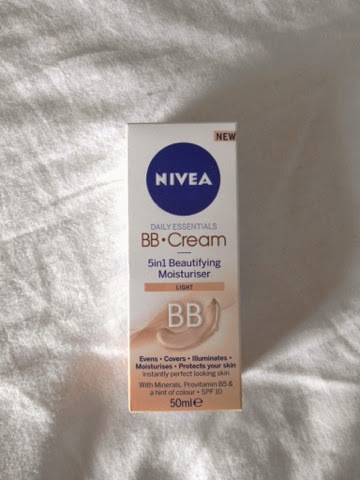 So, whilst thinking about trying out something a little less heavy on my face, I picked up this BB cream the other day, it's Nivea's Daily Essentials 5 in 1 Beautifying Moisturiser in the shade light. Nivea promises this will even, cover, illuminate, moisturise and protect your skin with an SPF of 10. That's quite a claim I must admit! 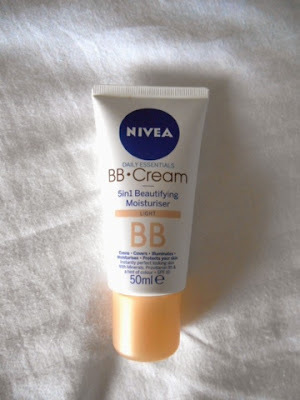 Selling itself as an all-in-one tinted moisturiser, I thought I would give it a go. I've always enjoyed Nivea products and find they work well with my skin. This was no surprise either! Firstly, the packaging is clean and fresh: the cream comes in a handy 50ml tube which is easy enough to pop in your make-up bag for on-the-go. It has that lovely Nivea scent which I always associate with their moisturising products, so as I apply it, it really just feels like I'm giving extra hydration to my skin and not wearing make-up at all, which I love! The only thing I will say is that their 'light' shade is actually too dark for my pre-summer skin colour, so I have been cheating and mixing it with my foundation. I like doing this though because firstly, it retains the lovely consistency of a moisturiser and secondly, it gives my face a lovely dewy look. I don't like my make-up to look too matte as it makes my skin appear rather dull. After applying it this morning, with the sun beaming through the window, I could really see how well hydrated my face looked, I didn't really feel the need to wear my highlighter after with this combination. So, all in all I'm really pleased with this little BB cream. I'm not sure if this is the lightest colour they offer so I'm going to check back and see because I would definitely snap it up again if they have a super light version! haha! Its really very nice and affordable too, if you just want to try something a little lighter on your skin without breaking the bank, I definitely recommend this as a good place to start! Hope you're all having a lovely day! What's in my make-up bag!